If you like horror, torture, and a lot of blood this is a movie to watch. It’s about a deadly battle over Jigsaw (Tobin Bell), a brutal legacy and revealing a secret of lies of an author named Bobby Dagan (Sean Patrick Flanery). I could not imagine doing what this character had to do to survive; like taking a string that is attached to a key out of someone’s stomach through the mouth, pulling my own teeth, or piercing my own flesh with big hooks. The movie kind of skipped around from different characters and flashbacks. Towards the end I didn’t even notice until the flashback of Dr. Lawence Gorden (Cary Elwes) that he was the guy who cut his own leg off from the first movie (Saw). If you have not seen this movie yet, go and rent it. 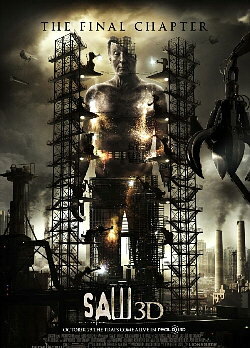 Comments for Saw 3D (The Final Chapter) are now closed.